Material Logistics - Material Logistics is the Infor Development Framework (IDF) replacement application for ISL/MISL for Infor XA ERP 7.8 and 9.0. With enhanced capabilities, the advantage is two-fold: Ease of setup and the ability to take advantage of all the Power-Link features and functionality. A very convenient and non-intrusive migration path has been developed to allow any company to go from the host applications to the IDF. 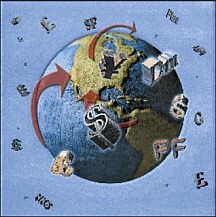 Multi-sourcing (Integration of Transfer Order Planning). InterSite Logistics - InterSite Logistics (ISL), along with the Infor ERP XA MRP and MPSP planning applications, addresses your supply chain management needs by integrating both the planning and execution of intersite demand and supply across sites and systems. Users can now plan demand for each distribution and production site with the Infor ERP XA planning applications. Distribution Requirements Planning (DRP) is a reality. Why? 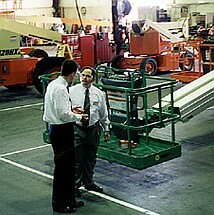 With InterSite Logistics, you can identify items in each site that are supplied from other sites. The time-phased planned demand for those items can be sent to the supplying site and then used in its production planning process. ISL also provides for creating, updating, shipping and receiving of intersite orders, tracking and maintaining visibility of the order at both sites, including while in transit between sites, and allowing each site the appropriate control over the intersite order during its life cycle. ISL provides all these capabilities for a single Infor XA ERP environment or database, regardless of how many sites are involved. Click here for the latest ISL Users Guide. Multi-Site InterSite Logistics - Multi-Site InterSite Logistics (MISL) extends the capabilities of InterSite Logistics (ISL) across your entire enterprise. Need the ability to operate both within and across Infor ERP XA environments, and across Infor ERP XA System i systems? Then MISL is the enterprise tool for you! ISL/MISLType 1i - With this enhancement, InterSite Logistics (ISL) and MultiSite Intersite Logistics (MISL) are enabled for "i"nvoicing. Now utilize Customer Order Management (COM) functionality such as picking and packing when filling InterSite orders, which is bypassed when using conventional ISL/MISL transactions. Besides simplifiying order placement and fulfillment processes, Type 1i also streamlines the issuing and receiving of payments for InterSite orders. Now electronic invoices and payments can be fully automated at actual cost or a pre-established selling price. 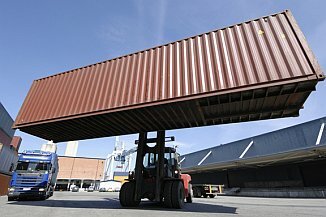 MISL FOB Ship - Using MultiSite InterSite Logistics (MISL) and challenged with the limitation of traditional MISL transactions when goods legally change hands? For some organizations this raises serious legal, regulatory and accounting issues. But FOB (Free-on-Board) shipping changes all of that. Take the headaches out of your FOB Shipping processes with this latest automation feature! 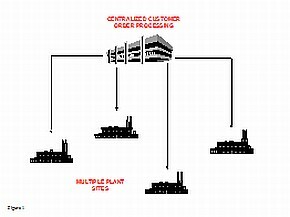 Customer Fulfillment Logistics - Customer Order Fulfillment Logistics (CFL) allows global organizations using the Infor XA ERP system to process customer orders from centralized or distributed locations and fulfill orders based on the most efficient production/shipping location. CFL is ideally suited for organizations with multiple plants, warehouses, or even multiple Infor ERP XA environments. CFL facilitates automatic order filling from the most efficient location based on customer location, product availability, etc. CFL also allows automatic updates to invoicing for centralized customer orders based on the activities at the remote locations. Developed using RPG IV and ILE RPG, it is maintained using the IBM Rational Developer for Power Systems toolset to insure the integration of latest features, and is available for i5.4, i6.1 and i7.1 for your System i or Power System. With data stored in your IBM DB2 for i database, your data integrity is secure. CFL is the solution for multi-location and international manufacturing enterprises! Electronic KanBan - Electronic KanBan facilitates the implementation of lean/kanban methodologies. With it you can capture shop floor transactions and automatically create orders in your primary business (ERP) system. 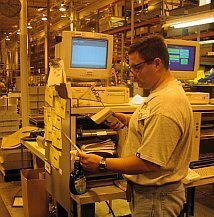 Electronic Kanban automatically creates manufacturing orders, purchase orders, repetitive schedules, and warehouse transfers. 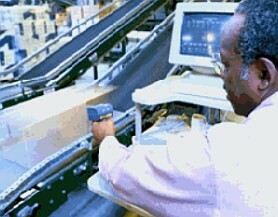 With a simple wand of a barcode, a worker on the shop floor can initiate a kanban replenishment order. 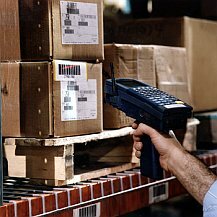 A second wand of the barcode closes out the order, backflushes allocations and labor (where appropriate) and creates the appropriate inventory transactions. The system can also initiate e-mail notifications to employees or trading partners when a kanban transaction is triggered. Developed using RPG IV and ILE RPG, it is maintained using the IBM Rational Developer for Power Systems toolset to insure the integration of latest features, and is available for i5.4, i6.1, i7.1, and i7.2 for your System i or Power System. With data stored in your IBM DB2 for i database, your data integrity is secure. Streamline your production capabilities now! COM Pick/Pack/Ship - COM Pick, Pack, Ship (COMPPS) automates the Pick, Pack, Ship transactions withtin the Customer Order Management (COM) module of Infor XA ERP enabling real-time COM interaction wtih custom or third party warehouseing applications. With COMPPS you can pick from a printed pick list, a fixed terminal, or wireless data collection device. Find out how COMPPS can simplify transaction processing in your finished goods and shipping warehouses. Intersite Propagator - InterSite PropaGator is the latest enhancement created for companies using the Infor XA ERP system and the MISL module. InterSite PropaGator has been designed to keep applications, files, and data current across multiple Infor XA ERP environments. It can be used on multiple environments on a single System i or an unlimited number of System i's. One of the most difficult tasks in running multiple Infor XA environments is keeping files synchronized across the enterprise. Historically this process would require time consuming replications or custom codding, or worse yet, re-keying of data. InterSite PropaGator is not program specific and utilizes IBM DB2 for i triggers, so it can be used to propagate nearly any file, record, or field of data. 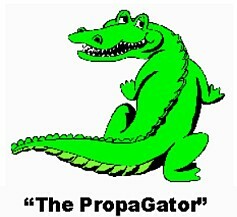 PropaGator is configurable and works in real-time, so all users in all locations see changes as they happen. 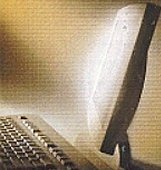 IBM Common Programming Interface Communications (CPI-C) programming and use of IBM Anynet/Enterprise Extender facilitate the "middleware" for intelligent communications between all systems. Developed using RPG IV and ILE RPG, it is maintained using the IBM Rational Developer for Power Systems toolset to insure the integration of latest features, and is available for i5.4, i6.1 and i7.1 for your System i or Power System. InterSite Propagator is a fast, simple, and effective solution to a very pressing problem!